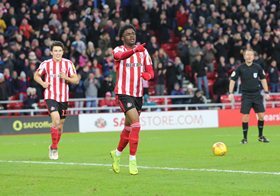 Crystal Palace have emerged as early favourites to sign Sunderland striker Josh Maja in the January transfer window. The 20-year-old comes off contract with the Black Cats at the end of the season but it is all but confirmed that he will leave the Stadium of Light this month as they are looking to recoup their previous investment in the player. According to The Sun, Huddersfield Town and Cardiff City are also monitoring the situation of Maja with a view to snapping him up from the League One side. The striker's intermediary has a good relationship with clubs in Germany and it is thought there is interest from an unnamed team in the country. Maja has been in blistering form since the start of the season, scoring 15 goals across all competitions, including 14 in the League One. The former Super Eagles invitee has played for the youth teams of Fulham, Crystal Palace and Manchester City in the past.